AdWords is primarily based on a pay-per-click (PPC) pricing model. So, you only pay when someone clicks on your ads. There is also CPM pricing, where you pay per 1,000 ad impressions, but this is not as popular as the PPC option. Whatever pricing model you choose, you determine the cost of your campaign by setting a daily budget. The pricing and budgeting options give you control over how much you pay in total, and how much you pay for each click. As already mentioned, one of the most common types of AdWords ad is a text ad that appears on Google search result pages. AdWords ads can appear in a number of other locations, including Google Image Search, Google Shopping, or the Google Search Partner Network. Google Shopping populates your ad with information taken from a product data feed you upload to Google. This includes the product image and price making them, in many situations, more impactful than text ads. The Google Search Partner Network includes some Google websites, as well as a network of millions of other websites that offer space to run ads. You can also run remarketing ad campaigns through AdWords. Instead of targeting ads using keywords, Google displays your ads to people who have visited your website in the past. Most ads set up in AdWords target keywords that people use when searching in Google. When someone searches with one of your selected keywords, Google uses a competitive auction to determine which ads to display. How Does the Competitive Auction Work? Keywords are a crucial part of running most types of ad campaigns using Google AdWords. In other words, getting your keyword strategy wrong can mean a lower return on investment. For example, if you mistakenly select keywords that don't have buying intent, you may end up paying for clicks from users who are searching for information, rather than for potential products to buy. Of course, keywords are not the only crucial factor of an effective Google AdWords campaign. In fact, in some campaigns, such as remarketing campaigns, keywords don’t apply at all. That said, for many campaigns, keywords are very important. Google gives your ad a Quality Score for each keyword you target. This score indicates how useful and relevant Google thinks your ad is. In simple terms, a better score is likely to get a more prominent placement. This applies even if another advertiser bids higher. Google uses several factors to determine Quality Score. This includes the content of the ad, the ad's CTR (Click-Through Rate), and the ad's landing page. This is the amount of money you are prepared to pay for each click. The level you set often determines if your ad appears for a particular search and, if so, where. AdWords is a comprehensive advertising tool offering a number of options depending on your industry, customers, and objectives. In addition, Google’s tools and platforms remain among the largest and most widely used on the internet. This means the potential audience you can reach is significant. 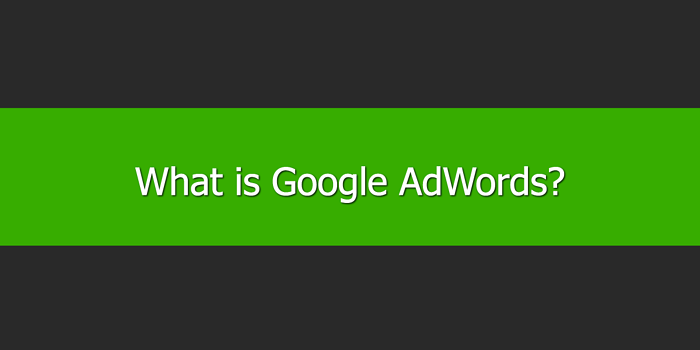 For many businesses, AdWords is an important part of their advertising strategy.